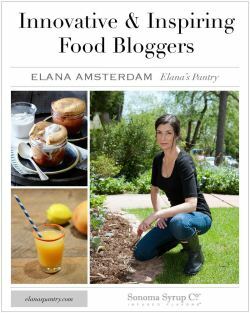 We’ve been following Elana’s Pantry for a while, and are obsessed with Elana Amsterdam’s healthy recipes and informative posts about health related topics. We asked her a few questions and were enlightened and inspired by her commitment to health and delicious food. 1. What inspired you to start writing a blog about food? My son was diagnosed with celiac disease at age 3. At that point I made it my mission to turn all of my favorite dishes from my childhood into gluten-free classics! 2. What do you most enjoy about cooking or baking? I absolutely love being in my kitchen. I find it an odd combination of peaceful, meditative, relaxation and productivity. I am so happy when I’m making food for myself, my family, and our friends. 3. Do you have any advice for those who want to eat healthy on a budget? Shopping online for pantry staples so that you can compare prices is a good way to save money. I also recommend going to a local farmer’s market. One other strategy that I use top reduce food costs is buying in bulk. 4. What are a few staple ingredients you believe everyone should have in their pantry? Well, everyone’s different, we’re all biochemical individuals and we all have different dietary needs. However, if I was buying my favorite products for a friend I would get them almond flour, coconut flour, coconut oil, coconut milk, dark chocolate (90% cacao), a variety of nut and seed butters including almond butter, sunflower butter and macadamia nut butter, as well as stevia and honey. I’d also give them a mason jar filled with my homemade steak rub (which we also use to season hamburgers and meat balls). 5. What are you looking forward to most about the future of your blog? Discussing biomedical treatments such as vitamin supplementation, hyperbaric oxygen therapy, as well as biofeedback tools such as Heart Math, so that my readers can continue to take charge of their health via diet and so much more. 6. What’s your favorite dish? Crackers! Here’s the recipe for my favorite gluten-free, grain-free crackers: Sesame Crackers. 7. Does travel inspire your recipes/cooking? If so, how? We went to Thailand on our honeymoon back in 1995. I remember being obsessed with making creamy Thai curries after that incredible trip. Last summer we went to Spain and ate fantastic food there, which inspired me to make all kinds of interesting spice rubs. Mostly though, I’m inspired by dishes I see in magazines or online that have gluten, sugar, corn, rice and other items that I cannot eat (I’ve been on a grain-free Paleo diet since 2001 for health reasons). I love whipping up my own healthy versions of traditional dishes with my own inspired twists!